Legendary investigative journalist Bob Woodward has done it again, getting beneath the surface of officialdom to gather an alternative narrative on the powers-that-be. 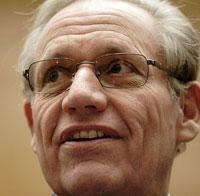 This time, Woodward has been on the hunt for the real story behind President Obama's Afghanistan strategy. And one of his conclusions is very straightforward. The key to the U.S. leaving Afghanistan, Woodward pointed out to host Tom Ashbrook Friday, is being able to train enough Afghan troops and police to keep the country stable. (Hear the full interview at the end of today's news roundtable.) But that training effort is proving a little like pouring water into a bucket with a hole in it, said Woodward, author of the new book "Obama's Wars." "The data shows that the number of people that they enter into the force is less than the attrition rate," he said. U.S. officials know this. And for Woodward, that bleak math undermines any statements by U.S. officials who claim "progress." This program aired on October 1, 2010. The audio for this program is not available.